Sync by Hickory Group was engaged by aged care provider Life Care to supply 96 bathroom pods across two typologies for Roselin Court, a 3-storey, 96-bed aged care facility located in Adelaide’s North. This was Sync’s first project in South Australia. Life Care recently made a $50 million investment into Roselin Court, the single largest investment in their history. A key objective for Life Care during the design of the Adelaide aged care facility was to enhance the quality of life and offer more comfort to residents, particularly through the use of appropriate furnishings and design, incorporating colours, acoustics and lighting, all working to reduce potential stress in dementia patients. 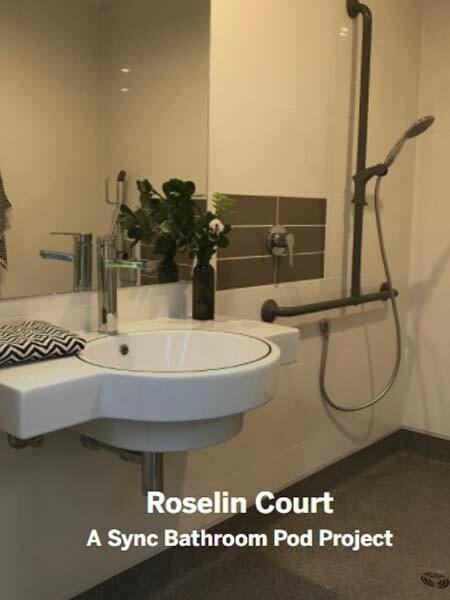 In keeping with the brief, Sync designed the bathroom pods for Roselin Court with great attention to detail using elements such as a contrasting black stripe around the basin to make it more visible, enabling easier recognition by residents. Expected to be completed in late 2017, this leading edge dementia care facility represents the latest research and understanding in the design of physical environments to support the elderly, particularly those with dementia, and will increase Roselin Court’s capacity by more than 35 per cent. Roselin Court is designed by architecture firm Marchese Partners and built by Mossop Group for Life Care.